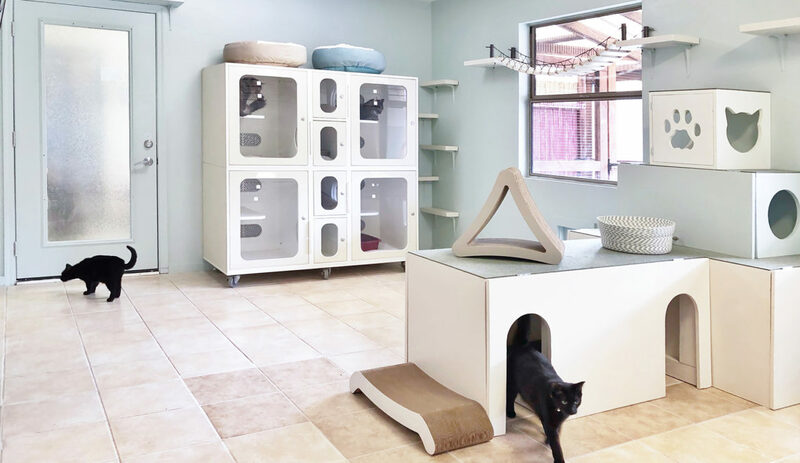 This breathtakingly beautiful space is Daily Mews Cat Cafe in Charlotte, NC. Tamara Leicester and her husband opened the cafe in April 2018. Tamara is a professional interior designer and it certainly shows in the spectacular design! The color palette of raspberry, teal and white is carried throughout the space and featured in this exquisite hand painted mural by artist Scott Partridge. The custom bench pictured above is made with TimberTech, a material used for outdoor decking. You can build with it just like you would use wood, but it’s very easy to clean and disinfect, perfect for a cat cafe environment. The space is divided into the cafe section and the cat lounge area, which are separated by a double door airlock. The cafe serves coffee and espresso drinks, beer and wine, and locally made pastries. Visitors are welcome to take their refreshments into the cat lounge area. There is also a small boutique with cat-themed gifts. 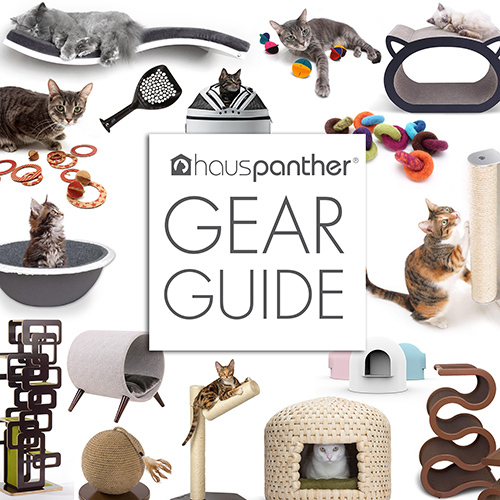 The space is completely catified, including a cat superhighway that extends all the way down the length of the room with cat trees at both ends for easy access. Big windows fill the space with natural light and two garden windows each with three levels of shelves are popular hangouts for the cats. When the cats are not watching birds at the outdoor feeders, they can watch wildlife videos playing on the giant TV. 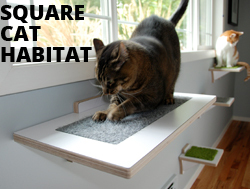 The cats’ food and litter boxes are located in a large retreat room that they can access via cutouts in the wall at the ground level and from the superhighway. It’s always a great idea to have a space where the cats can get away from the activity if they need a little time out. 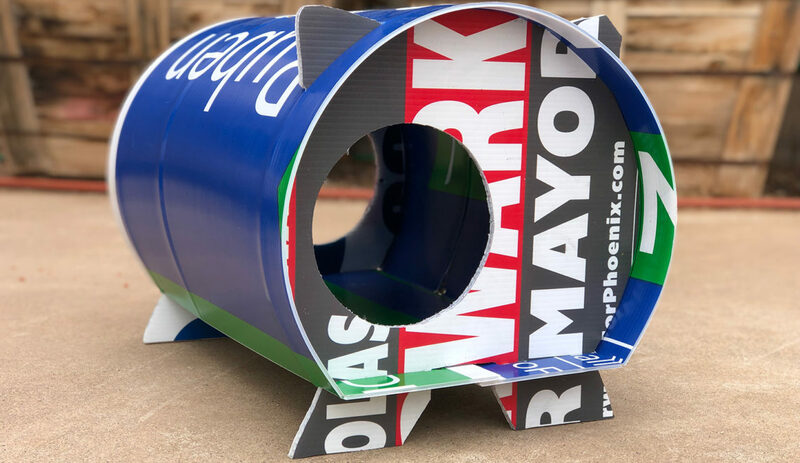 The cat trees are from one of our favorite companies, ContempoCat, who is located in Charlotte where Daily Mews is. They painted the natural wood to match the color scheme, creating a totally customized look. All of the painted surfaces in the cat lounge have multiple coats of paint and/or polyurethane for durability and easy cleaning. As of today, Daily Mews Cat Cafe has adopted out 85 cats and counting! If you’re ever in Charlotte make sure to stop by to see this incredible cat cafe. Visit dailymewscharlotte.com for more information about reservations and special events. This was the first space I designed totally with the needs of cats in mind. It’s been gratifying to see how much they use every aspect of the room, find their own favorite spots, and just really enjoy themselves. The customers enjoy the space too, both for the aesthetics and I think in large part because the cats are usually so chill and happy. It’s an overall relaxed and peaceful vibe. They obviously put a lot of thought, work, and love into this — wishing them all success!